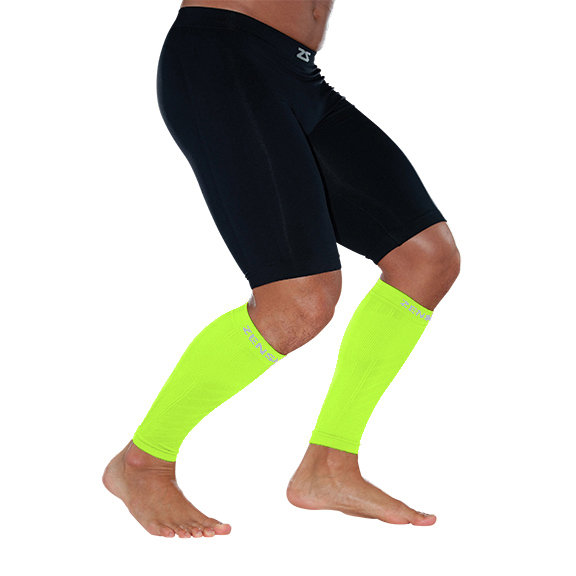 Zensah has developed compression leg sleeves using a special knitting process and fabric. Zensah compression leg sleeves are made with gradient compression which provides wide ribbing in the front for shin support and tight ribbing in the back for calf support. Zensah compression leg sleeves are made with Zensah Fabric which has silver helping to regulate skin temperature and fight bacteria. The compression leg sleeves can be worn during training or for recovery to increase oxygen blood flow to the muscles of the lower leg. The more oxygen the muscles receive the faster they recover, allowing athletes to push the envelope in their training. The compression leg sleeves are ideal for runners, cyclists and triathletes and anyone else who is on their feet. It can be worn during training, recovery or for traveling. The compression leg sleeves, item #6055, are sold in a pair, #6045 are sold individually. Various colors, call to order. My 12 yr old grandson wore a red pair to 2 silver medal places at the AAU Indoor Nationals in the 60 and 200 meters 12 yr old Division. Team colors are changing. He like the fit of red ones, so I'm sure these will get the job as well.